Welcoming in a new year and looking forward to big one. With the prominent NSW dealers not getting back to us after multiple attempts to set and so much promise it looks like we are to find ourselves another gallery in that part of the world. One door closes, and another opens and website sales remain at this stage. It has been a strange one after meeting and phone calls over a long period of time its disapointing that nothing has happened. Its been some time now since our East Kimberely trip and I think it has taken all that time to digest. It has made both Dave and myself see our art in a whole new light and we are very much looking forward to our show coming up in April at Boom Gallery in Geelong. It time for a whole new approach and we are really excited to get some paint down on canvas. Its time to raise the bar. It has been a good time to think more on this quote and act on it. Sometimes as an artist you can spend so long trying to be unique. It can be be good to just let go with all the influences that come at you. 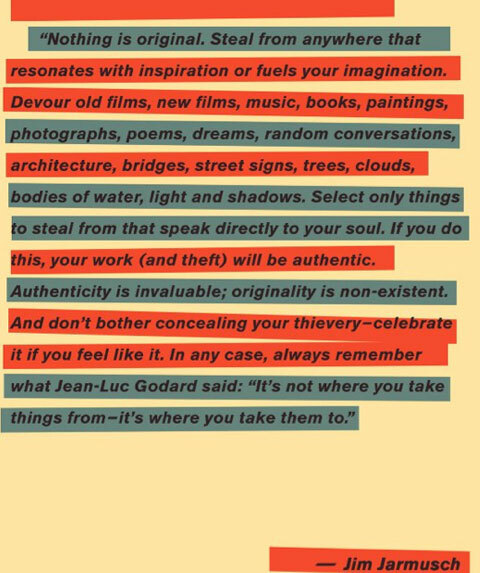 In homage to Jene-Luc Godard its good steal something similar and see where you take it.